SpaceX has reportedly announced to have completed the static fire test of Falcon 9 rocket that would be launched with an Argentine radar satellite from the Vandenberg Air Force Base in California. As per trusted sources, the Falcon 9 rocket would reuse the first stage booster from an earlier mission that carried about 10 Iridium communications satellites into orbit. Reportedly, the liftoff has been scheduled for Sunday from Space Launch Complex 4-West at Vandenberg Air Force Base which is a military-run spaceport on the Central Coast of California, northwest of Los Angeles. The SAOCOM 1A radar Earth-imaging satellite of Argentina would be installed on the Falcon 9 rocket after the launcher from its SLC-4W launch pad is lowered by the ground crew and is returned to an adjoining hangar, cite sources. The Earth-imaging satellite reached Vandenberg in the initial days of August after riding an Antonov An-124 cargo airplane from an airport situated near the factory at Bariloche, Argentina. It reportedly passed through a customs check in Los Angeles and stopped at Cancun before landing at the Vandenberg Air Force Base to commence final pre-flight preparations. Sources privy to the matter claim that the satellite has been fitted with an L-band steerable synthetic aperture radar that scans the globe to enable all-weather imagery of the Earth at all times of the day. Reportedly, the radar imagers are effective 24 hours a day and can see through clouds, but the optical cameras are hindered by darkness and clouds. For the record, SAOCOM 1A is the first of the two identical radar observation satellites being developed by the national space agency of Argentina, CONAE. The satellites are manufactured by a consortium of Argentine firms currently led by INVAP. 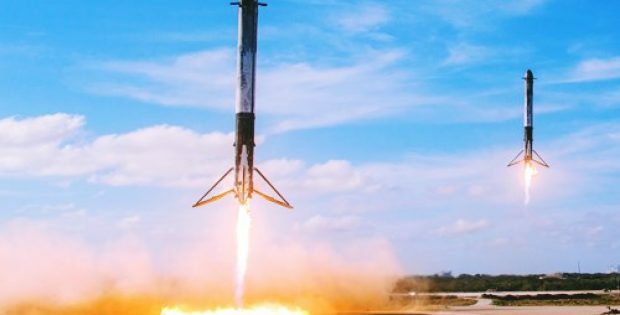 SpaceX shared a photo of the Falcon 9 rocket and its strong back structure vertical on Twitter. The photo reportedly also shows a cargo train being moved along a railroad track adjacent to the rocket overlooking the Pacific Ocean.